For other uses, see Utica. Utica (/ˈjuːtɪkə/ ( listen)) is a city in the Mohawk Valley and the county seat of Oneida County, New York, United States. The tenth-most-populous city in New York, its population was 62,235 in the 2010 U.S. census. Located on the Mohawk River at the foot of the Adirondack Mountains, Utica is approximately 95 miles (153 kilometers) northwest of Albany, 55 mi (89 km) east of Syracuse and 240 miles (386 kilometers) northwest of New York City . Utica and the nearby city of Rome anchor the Utica–Rome Metropolitan Statistical Area, which comprises all of Oneida and Herkimer counties. Formerly a river settlement inhabited by the Mohawk tribe of the Iroquois Confederacy, Utica attracted European-American settlers from New England during and after the American Revolution. In the 19th century, immigrants strengthened its position as a layover city between Albany and Syracuse on the Erie and Chenango Canals and the New York Central Railroad. During the 19th and 20th centuries, the city's infrastructure contributed to its success as a manufacturing center and defined its role as a worldwide hub for the textile industry. Utica's 20th-century political corruption and organized crime gave it the nickname "Sin City." Like other Rust Belt cities, Utica underwent an economic downturn beginning in the mid-20th century. The downturn consisted of industrial decline due to globalization and the closure of textile mills, population loss caused by the relocation of jobs and businesses to suburbs and to Syracuse, and poverty associated with socioeconomic stress and a decreased tax base. With its low cost of living, the city has become a melting pot for refugees from war-torn countries around the world, encouraging growth for its colleges and universities, cultural institutions and economy. Several theories exist regarding the history of the name "Utica". Although surveyor Robert Harpur stated that he named the village, the most accepted theory involves a 1798 meeting at Bagg's Tavern (a resting place for travelers passing through the village) where the name was picked from a hat holding 13 suggestions. Utica was included because Utica (in modern-day Tunisia) is a city of antiquity: several other upstate New York cities had adopted classical Mediterranean city names earlier, such as Troy (1789) and Rome (1796), or would later, as with Syracuse (1847). An 1802 engraved map of Utica. The Mohawk River is at the top, and Bagg's Tavern is at the center right. This 1883 index map shows the development around Utica and Bagg's Square, with the Erie Canal (now Oriskany Street) and Chenango Canal towards the upper-right. Utica was established on the site of Old Fort Schuyler, built by English colonists for defense in 1758 during the French and Indian War, the North American front of the Seven Years' War against France. Prior to construction of the fort, the Mohawk, Onondaga and Oneida tribes had occupied this area south of the Great Lakes region as early as 4000 BC. The Mohawk were the largest and most powerful tribe in the eastern part of the Mohawk Valley. Colonists had a longstanding fur trade with them, in exchange for firearms and rum. The tribe's dominating presence in the region prevented the Province of New York from expanding past the middle of the Mohawk Valley until after the American Revolutionary War, when the Iroquois were forced to cede their lands as allies of the defeated British. The land housing Old Fort Schuyler was part of a 20,000 acres (81 km2) portion of marshland granted by King George II to New York governor William Cosby on January 2, 1734. Since the fort was located near several trails (including the Great Indian Warpath), its position—on a bend at a shallow portion of the Mohawk River—made it an important fording point. The Mohawk called the bend Unundadages ("around the hill"), and the Mohawk word appears on the city's seal. During the American Revolution, border raids from British-allied Iroquois tribes harried the settlers on the frontier. George Washington ordered Sullivan's Expedition, Rangers, to enter Central New York and suppress the Iroquois threat. More than 40 Iroquois villages were destroyed and their winter stores, causing starvation. In the aftermath of the war, numerous European-American settlers migrated into the state and this western region from New England, especially Connecticut. In 1794 a state road, Genesee Road, was built from Utica west to the Genesee River. That year a contract was awarded to the Mohawk Turnpike and Bridge Company to extend the road northeast to Albany, and in 1798 it was extended. The Seneca Turnpike was key to Utica's development, replacing a worn footpath with a paved road. The village became a rest and supply area along the Mohawk River for goods and the many people moving through Western New York to and from the Great Lakes. The boundaries of the village of Utica were defined in an act passed by the New York State Legislature on April 3, 1798. Utica expanded its borders in subsequent 1805 and 1817 charters. On April 5, 1805, the village's eastern and western boundaries were expanded, and on April 7, 1817, Utica separated from Whitestown on its west. After completion of the Erie Canal in 1825, the city's growth was stimulated again. The municipal charter was passed by the state legislature on February 13, 1832. The city's growth during the 19th century is indicated by the increase in its population; in 1845 the United States Census ranked Utica as the 29th-largest in the country (with 20,000 residents), more than the populations of Chicago, Detroit and Cleveland, respectively. Utica's location on the Erie and Chenango canals encouraged industrial development, allowing the transport of anthracite from northeastern Pennsylvania for local manufacturing and distribution. Utica's economy centered around the manufacture of furniture, heavy machinery, textiles and lumber. The combined effects of the Embargo Act of 1807 and local investment enabled further expansion of the textile industry. Like other upstate New York cities, mills in Utica processed cotton from the Deep South, a slave society. Much of the New York economy was closely involved with slavery; in the antebellum period, half of New York's exports were related to cotton. In addition to the canals, transport in Utica was bolstered by railroads running through the city. The first was the Mohawk and Hudson Rail Road, which became the Utica and Schenectady Railroad in 1833. Its 78-mile (126 km) connection between Schenectady and Utica was developed in 1836 from the right-of-way previously used by the Mohawk and Hudson River railway. Later lines, such as the Syracuse and Utica Railroad, merged with the Utica and Schenectady to form the New York Central Railroad, which originated as a 19th-century forest railway in the Adirondacks. During the 1850s, Utica was known to aid more than 650 fugitive slaves; it played a major role as a station in the Underground Railroad. The city was on a slave escape route from the Southern Tier to Canada by way of Albany, Syracuse and Rochester. The route, used by Harriet Tubman to travel to Buffalo, guided slaves to pass through Utica on the New York Central Railroad right-of-way en route to Canada. Utica was the locus for Methodist preacher Orange Scott's antislavery sermons during the 1830s and 1840s, and Scott formed an abolitionist group there in 1843. Despite efforts by local abolitionists, pro-slavery riots and mobs, who wanted to protect the cotton mills, forced many abolitionist meetings to other cities. The early 20th century brought rail advances to Utica, with the New York Central electrifying 49 miles (79 km) of track from the city to Syracuse in 1907 for its West Shore interurban line. In 1902, the Utica and Mohawk Valley Railway connected Rome to Little Falls with a 37.5-mile (60.4 km) electrified line through Utica. Looking north towards the corner of Genesee and Bleecker streets, c. 1900–1915. Streetcars can be seen crossing a bridge over the Erie Canal. By the 1950s, Utica was known as "Sin City" because of the extent of its corruption at the hands of the Democratic Party political machine. During the late 1920s, trucker Rufus Elefante rose to power although he never ran for office. Originally a Republican, Elefante's power was enhanced by support from New York governor Franklin D. Roosevelt. Waves of Italian, Irish, Polish and Lebanese Maronite immigrants worked in the city's industries in the early part of the 20th century. Until the 1980s, organized crime had a strong role in the city. Strongly affected by the deindustrialization that took place in other Rust Belt cities, Utica suffered a major reduction in manufacturing activity during the second half of the 20th century. The 1954 opening of the New York State Thruway (which bypassed the city) and declines in activity on the Erie Canal and railroads throughout the United States also contributed to a poor local economy. During the 1980s and 1990s, major employers such as General Electric and Lockheed Martin began to close plants in Utica and Syracuse. With city jobs moved to the towns and villages around Utica during the suburbanization of the postwar period. This led to the expansion of the nearby Town of New Hartford and the village of Whitesboro. Utica's lack of quality academic and educational choices, when compared to Syracuse under an hour away, contributed to its decline in local businesses and jobs as some economic activity moved to Syracuse during the 1990s. Utica's population fell while population in the county increased, reflecting a statewide trend of decreasing urban populations outside New York City. Residents who remain in the city struggle to handle poverty issues stemming from social and economic conditions caused partially by a smaller tax base; this adversely affects schools and public services. Despite the city's economic decline, it has benefited from a low cost of living, attracting immigrants and refugees from around the world. In 2010, Utica, the focus of local, regional and statewide economic-revitalization efforts, developed its first comprehensive master plan in more than a half-century. According to the United States Census Bureau, Utica has a total area of 17.02 square miles (44.1 km2)—16.76 square miles (43.4 km2) of land and 0.26 square miles (0.67 km2) (1.52 percent) of water. The city is located at New York's geographic center, adjacent to the western border of Herkimer County, and at the southwestern base of the Adirondack Mountains. 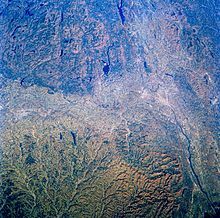 Utica and its suburbs are bound by the Allegheny Plateau in the south and the Adirondack Mountains in the north, and the city is 456 feet (139 m) above sea level. The city is 90 mi (145 km) northwest of Albany and 45 mi (72 km) east of Syracuse. The Utica Marsh is a series of wetlands north of the city. The city's Mohawk name, Unundadages ("around the hill") refers to a bend in the Mohawk River that flows around the city's elevated position as seen from the Deerfield Hills in the north. The Erie Canal and Mohawk River pass through northern Utica; northwest of downtown is the Utica Marsh, a group of cattail wetlands between the Erie Canal and Mohawk River (partially in the town of Marcy) with a variety of animals, plants and birds. During the 1850s, plank roads were built through the marshland surrounding the city. Utica's suburbs have more hills and cliffs than the city. Located where the Mohawk Valley forms a wide floodplain, the city has a generally sloping, flat topography. Utica's architecture features many styles that are also visible in comparable areas of Buffalo, Rochester and Syracuse, including Greek Revival, Italianate, French Renaissance, Gothic Revival and Neoclassical. The modernist 1972 Utica State Office Building, at 17 floors and 227 feet (69 m), is the city's tallest. Streets laid out when Utica was a village had more irregularities than those built later in the 19th and 20th centuries. As a result of the city's location (adjacent to the Mohawk River), many streets parallel the river, so they do not run strictly east-west or north–south. Remnants of Utica's early electric-rail systems can be seen in the West and South neighborhoods, where the rails were set into the streets. Utica's neighborhoods have historically been defined by their residents, allowing them to develop their own individuality. Racial and ethnic groups, social and economic separation and the development of infrastructure and new means of transportation have shaped neighborhoods, with groups shifting between them as a result. West Utica (or the West Side) was historically home to German, Irish and Polish immigrants. The Corn Hill neighborhood in the city center had a significant Jewish population. East Utica (or the East Side) is a cultural and political center dominated by Italian immigrants. North of downtown is the Triangle neighborhood, formerly home to the city's African American and Jewish populations. Neighborhoods formerly dominated by one or more groups saw other groups arrive, such as Bosnians and Latin Americans in former Italian neighborhoods and the Welsh in Corn Hill. Bagg Commemorative Park and Bagg's Square West (Utica's historic centers) are in the northeastern portion of downtown, with Genesee Street on the west and Oriskany Street on the south. Utica has a continental climate with four distinct seasons and is in the humid continental climate (or warm-summer climate: Köppen Dfb) zone, characterized by cold winters and temperate summers. Summer daytime temperatures range from 70–82 °F (21-28 °C), with an average winter daytime temperature below -3 °C (27 °F). The city is in USDA plant hardiness zone 5a, and native vegetation can tolerate temperatures from -10 °F to -20 °F (-28.9 °C to -26.1 °C). Winters are cold and snowy; Utica receives lake-effect snow from Lake Erie and Lake Ontario. Utica is colder on average than other Great Lakes cities because of its location in a valley and susceptibility to north winds; temperatures in the single digits or below zero Fahrenheit are not uncommon on winter nights. Annual precipitation (based on a 30-year average from 1981–2010) is 42.1 inches (107 cm), falling on an average of 171 days. Although Utica's population is predominantly European American, it has diversified since the 1990s. New immigrants and refugees have included Bosnians (displaced by the Bosnian War), Burmese, Latinos, Russians, and Vietnamese. More than 15 languages are spoken in the city. Utica's population halted a forty-year decline in 2010, influenced by this influx of refugees and immigrants. Utica has a low cost of living but its industrial and economic decline have posed difficulties for people trying to make a new start. In the 2010 United States Census, Utica's population was 62,235. Sixty-nine percent of the population was European American (of which 64.5 percent was non-Hispanic white), 15.3 percent was African American, and 0.3 percent was American Indian or Alaska Native. Asians were 7.2 percent of the city's population (3.5 percent Burmese, 1.5 percent Vietnamese, 0.7 percent Cambodian, 0.4 percent Indian, 0.2 percent Chinese, and 0.7 percent other Asian; numbers do not add up to 7.2 percent due to rounding), Native Hawaiians and Pacific Islanders were 0.1 percent, and Hispanics or Latinos of any race were 10.5 percent (6.8 percent Puerto Rican, 1.5 percent Dominican, 0.4 percent Mexican, 0.3 percent Salvadoran, 0.2 percent Ecuadoran, 0.1 percent Cuban and 1.2 percent other Hispanic or Latino). Other races were 3.9 percent, and multiracial individuals made up four percent of the population. Median income for a Utica household was $30,818. Per capita income was $17,653, and 29.6 percent of the population were below the poverty threshold. Infrastructure projects, such as the North-South Arterial Highway and New York State Route 840, provide local jobs. During the mid-19th century, Utica's canals and railroads supported industries producing furniture, locomotive headlights, steam gauges, firearms, textiles and lumber. World War I sparked the growth of Savage Arms, which produced the Lewis gun for the British Army, and the city prospered as one of the wealthiest per capita in the United States. In the early 20th century, the local textile industry began to decline, which had a significant impact on the local economy. The boll weevil adversely affected southern cotton crops in this period. During the late 1940s, air-conditioned mills opened in the southern United States, and jobs were lost as factories were moved south, where labor costs were lower because "right to work" laws weakened unions. Other industries also moved out of the city during a general restructuring in older industrial cities. New industries to rise in the city were electronics manufacturing (led by companies such as General Electric, which produced transistor radios), machinery and equipment, and food processing. The city struggled to make a transition to new industries. During the second half of the 20th century, the city's recessions were longer than the national average. The exodus of defense companies (such as Lockheed Martin, formed from the merger of the Lockheed Corporation and Martin Marietta in 1995) and the electrical-manufacturing industry played a major role in Utica's recent economic distress. From 1975 to 2001, the city's economic growth rate was similar to that of Buffalo, while other upstate New York cities such as Rochester and Binghamton outperformed both. In the early 21st century, the Mohawk Valley economy is based on logistics, industrial processes, machinery, and industrial services. In Rome, the former Griffiss Air Force Base has remained a regional employer as a technology center. The Turning Stone Resort & Casino in Verona is a tourist destination, with a number of expansions during the 1990s and 2000s. Utica's larger employers include the ConMed Corporation (a surgical-device and orthotics manufacturer) and Faxton St. Luke's Healthcare, the city's primary health care system. Construction, such as the North-South Arterial Highway project, supports the public-sector job market. Although passenger and commercial traffic on the Erie Canal has declined greatly since the 19th century, the barge canal still allows heavy cargo to travel through Utica at low cost, bypassing the New York State Thruway and providing intermodal freight transport with the railroads. The United States District Court for the Northern District of New York has offices in the Alexander Pirnie Federal Building. Democrat Robert M. Palmieri, elected in 2011, is Utica's current mayor. The common council consists of 10 members, six of whom are elected from single-member districts. The other four, including its president, are elected at-large. The council has eight standing committees for issues including transportation, education, finance and public safety. There is a relative balance between the Democratic and Republican parties, a change from the predominantly single-party politics of the 20th century. Throughout the 1950s, Democrats held the mayor's office and a majority on the city council. Utica is in New York's 22nd congressional district, which has been represented by Democrat Anthony Brindisi since 2019. The city is served by the United States District Court for the Northern District of New York, with offices in the Alexander Pirnie Federal Building. According to the comptroller's office, Utica's governmental expenses totaled $79.3 million in 2014 (a net increase of $940,000 from the previous year). The 2015–16 budget proposes general-fund spending of $66.3 million. City taxes collected in 2014 were $25,972,930, with a tax rate per thousand of $25.24. According to the city's police department, there were six murders, 125 robberies, 22 rapes, and 237 assaults in 2014 (an increase from the previous year, representing a violent-crime rate of 0.6 percent). There were 432 burglaries, 1,845 larcenies and 107 motor-vehicle thefts (a decrease from 2013, representing a property-crime rate of 3.8 percent). Compared to other cities in New York, Utica's crime rate is generally low. The Utica Police Department patrols the city, and law enforcement is also under the jurisdiction of the Oneida County Sheriff's Office and the New York State Police. The Utica Fire Department coordinates four engines, two truck companies, and rescue, HAZMAT and medical operations with a 123-person crew. Utica's position in the northeastern United States has allowed the blending of cultures and traditions. The city shares characteristics with other cities in Central New York, including its dialect (Inland Northern American English, also present in other Rust Belt cities such as Buffalo, Elmira and Erie, Pennsylvania). Utica shares a cuisine with the mid-Atlantic states, with local and regional influences. The city's melting pot of immigrant and refugee cuisines, including Dutch, Italian, German, Irish and Bosnian, has introduced dishes such as ćevapi and pasticciotti[e] to the community. Utica staple foods include chicken riggies, Utica greens, half-moons, mushroom stew, and tomato pie. Other popular dishes are pierogi, penne alla vodka, and sausage and peppers. Utica has long had ties to the brewing industry. The family-owned Matt Brewing Company resisted the bankruptcies and plant closings that came with the industry consolidation under a few national brands. As of 2012, it was ranked the 15th-largest brewery by sales in the United States. The annual 15-kilometre (9.3 mi) Boilermaker Road Race, organized by the city in conjunction with the National Distance Running Hall of Fame, attracts runners from the region and around the world, including Kenya and Romania. The Children's Museum of Natural History, Science and Technology, next to Union Station, opened in 1963. In 2002, the museum partnered with NASA, featuring exhibits and events from the agency. The Munson-Williams-Proctor Arts Institute, founded in 1919, features a PrattMWP program in cooperation with the Pratt Institute, and permanent collections and rotating exhibits. The Utica Psychiatric Center is housed in a Greek Revival structure that was an insane asylum, and the birthplace of the Utica crib—a restraining device frequently used at the asylum from the mid-19th century to 1887. The Stanley Center for the Arts, a mid-sized concert and performance venue, was designed by Thomas W. Lamb in 1928 and today features theatrical and musical performances by local and touring groups. The Hotel Utica, designed by Esenwein & Johnson in 1912, became a nursing and residential-care facility during the 1970s. Notable guests had included Franklin D. Roosevelt, Judy Garland and Bobby Darin. It was restored as a hotel in 2001. Utica is home to the Utica Comets, a team affiliated with the National Hockey League's Vancouver Canucks. Formerly the Peoria Rivermen, the team moved to Utica and began playing in the American Hockey League during the 2013–14 season. The 3,815-seat Adirondack Bank Center, which opened in 1960, as the Utica Memorial Auditorium, is home to the Comets and the Utica College Pioneers. The Utica Devils played in the AHL from 1987 to 1993, and the Utica Bulldogs (1993–94), Utica Blizzard (1994–97), and Mohawk Valley Prowlers (1998–2001) were members of the United Hockey League (UHL). The city was home to the Utica Blue Sox (1939–2001), a New York–Penn League baseball team also affiliated with the Toronto Blue Jays and, later, the Miami Marlins. Other former baseball teams included the Utica Asylums (1900) and the Boston Braves-affiliated Utica Braves (1939–42). Since 2008, the city has been home to a collegiate summer baseball team also called the Blue Sox. Utica's parks system consists of 677 acres (274 ha) of parks and recreation centers; most of the city's parks have community centers and swimming pools. Frederick Law Olmsted, Jr., who designed New York City's Central Park and Delaware Park in Buffalo, designed the Utica Parks and Parkway Historic District. Olmsted also designed Memorial Parkway, a 4-mile (6.4 km) tree-lined boulevard connecting the district's parks and encircling the city's southern neighborhoods. The district includes Roscoe Conkling Park, the 62-acre F.T. Proctor Park, the Parkway, and T.R. Proctor Park. The city's municipal golf course, Valley View (designed by golf-course architect Robert Trent Jones), is in the southern part of the city near the town of New Hartford. The Utica Zoo and the Val Bialas Ski Chalet, an urban ski slope featuring skiing, snowboarding, outdoor skating, and tubing, are also in south Utica in Roscoe Conkling Park. Smaller neighborhood parks in the district include Addison Miller Park, Chancellor Park, Seymour Park, and Wankel Park. The Utica Canal Terminal Harbor is connected to the Erie Canal and Mohawk River. Despite the decrease in rail traffic, Utica's rail yard remains active. Griffiss International Airport in Rome primarily serves military and general aviation, and Syracuse Hancock International Airport and Albany International Airport provide regional, domestic, and international passenger air travel in the Utica–Rome Metropolitan Area. Amtrak's Empire (two unnamed trains), Maple Leaf, and Lake Shore Limited trains stop at Utica's Union Station. Bus service is provided by the Central New York Regional Transportation Authority (CENTRO), a Syracuse public transport operator which runs 12 lines in Utica and has a downtown hub. Intercity bus service is provided by Greyhound Lines, Short Line, Adirondack Trailways, and the Birnie Bus Company, with weekday and Saturday service to Syracuse; both stop at Union Station. Early Federal Highway Administration map of the Interstate Highway System in Utica; Interstates 90 and 790 are in the shaded portion. During the 1960s and 1970s, New York state planners envisioned a system of arterial roads in Utica that would include connections to Binghamton and Interstate 81. Due to community opposition, only parts of the highway project were completed, including the North–South Arterial Highway running west of the city. Six New York State highways, one three-digit interstate highway, and one two-digit interstate highway pass through Utica. New York State Route 49 and State Route 840 are east–west expressways running along Utica's northern and southern borders, respectively, and the eastern terminus of each is in the city. New York State Route 5 and its alternate routes—State Route 5S and State Route 5A—are east–west roads and expressways that pass through Utica. The western terminus of Route 5S and the eastern terminus of Route 5A are both in the city. With Route 5 and Interstate 790 (an auxiliary highway of Interstate 90), New York State Route 12 and State Route 8 form the North–South Arterial Highway. Power transmission lines through the Utica Marsh; many lines pass through Utica, transporting power to New York City. Electricity in Utica is provided by National Grid plc, a British energy corporation that acquired the city's former electricity provider, Niagara Mohawk, in 2002. Utica is near the crossroads of major electrical-transmission lines, with substations in the town of Marcy. An expansion project by the New York Power Authority, National Grid, Consolidated Edison, and New York State Electric and Gas (NYSEG) is planned. In 2009 city businesses (including Utica College and St. Luke's Medical Center) developed a microgrid, and in 2012 the Utica City Council explored the possibility of a public, city-owned power company. Utica's natural gas is provided by National Grid and NYSEG. Municipal solid waste is collected and disposed of weekly by the Oneida-Herkimer Solid Waste Authority, a public-benefit corporation that coordinates single-stream recycling, waste reduction, composting, and the disposal of hazardous materials and demolition debris. Utica's wastewater is treated by the Mohawk Valley Water Authority, with a capacity of 32 million gallons per day. Treated water is tested for impurities including pathogens, nitrates, and nitrites. Utica's drinking water comes from the stream-fed Hinckley Reservoir in the foothills of the Adirondack Mountains, with 700 miles (1,100 km) of piping throughout the city. Primary health care in Utica is provided by the Mohawk Valley Health System, a nonprofit organization that operates Faxton St. Luke's Healthcare and St. Elizabeth Medical Center. The St. Luke's and Faxton hospitals have a total of 370 acute and 202 long-term beds, and St. Elizabeth Medical Center has 201 acute-care beds. St. Luke's and Faxton are surgical centers, and St. Elizabeth is a trauma and surgical center. The Mohawk Valley Health System plans to construct a new hospital in Downtown Utica by 2022, consolidating many operations at the existing hospital campuses. Like Ithaca and Syracuse, Utica has a mix of public and private colleges and universities; three state colleges and four private colleges are in the Utica–Rome metropolitan area. SUNY Polytechnic Institute, on an 850-acre campus in North Utica and Marcy, has over 2,000 students and is one of eight technology colleges and 14 doctorate-granting universities of the State University of New York (SUNY). Mohawk Valley Community College is the largest college between Syracuse and Albany with nearly 7,000 students, and an Empire State College location serves Utica and Rome. Formerly a satellite campus of Syracuse University, Utica College is a four-year private liberal arts college with over 3,000 students. Established in 1904, St. Elizabeth College of Nursing partners with regional institutions to grant nursing degrees. Pratt Institute offers a local two-year fine-arts course. The Utica School of Commerce, a for-profit business college, closed at the end of 2016. The Utica City School District had an enrollment of nearly 10,000 in 2012 and is the most racially diverse school district in Upstate New York. District schools include Thomas R. Proctor High School, James H. Donovan Middle School, John F Kennedy middle school and ten elementary schools. Utica's original public high school, the Utica Free Academy, closed in 1987. The city is also home to Notre Dame Junior Senior High School, a small Catholic high school founded in 1959 by the Xaverian Brothers. The Utica Public Library, a historic neoclassical-style building, opened in 1903. Utica is served by three stations affiliated with major television networks: WKTV 2 (NBC; CBS on DT2; CW on DT3), WUTR 20 (ABC), and WFXV 33 (Fox). PBS member station WCNY-TV in Syracuse operates translator W22DO-D on analog channel 22 and digital channel 24. Several low-power television stations, such as WPNY-LP 11 (MyNetworkTV), also broadcast in the area. Cable television viewers are served by the Syracuse office of Charter Communications (doing business as Charter Spectrum), which offers a local news service and public-access channels. Dish Network and DirecTV provide satellite television customers with local broadcast channels. Utica's main daily newspaper is the Observer-Dispatch; the Utica Phoenix, established in 2002, is an alternative. The city has 26 FM radio stations and nine AM stations. Major station owners in the area include Townsquare Media and Galaxy Communications. In addition to minor popular-culture references, Slap Shot (1977) was partially filmed in Utica, and the city has been featured on the TV series The Office. The Mid York Library System serves Utica and is chartered by the Board of Regents of the University of the State of New York. The library system operates 43 libraries (including the Utica Public Library) in Oneida, Herkimer and Madison counties. ^ Estimated MSA rank as of July 1, 2014. ^ Humidity data calculated from the averages of morning and evening relative humidities. ^ Calculated from the total populations of Oneida, Herkimer, Schenectady, Otsego, Fulton, and Montgomery counties as of the 2010 census. ^ Locally known as "pusties"
^ Bottini, Joseph L.; Davis, James L. (2007). Utica. Arcadia Publishing. p. 90. ISBN 978-0-7385-5496-9. ^ Bagg 1892, p. 20. ^ a b c d e Ripley, George; Dana, Charles A., eds. (1879). "Utica (New York)" . The American Cyclopædia. 16 (1879 ed.). D. Appleton & Company – via Wikisource. ^ a b Bagg 1892, p. 199. ^ "U.S. Census Bureau, 2011-2015 American Community Survey 5-Year Estimates". 2015 Population Estimates. United States Census Bureau, Population Division. Retrieved April 20, 2017. ^ "Census Urban Area List". United States Census Bureau. Archived from the original on March 28, 2012. Retrieved May 7, 2015. ^ "Metropolitan and Micropolitan Statistical Areas". United States Census Bureau, Population Division. June 9, 2014. Archived from the original on June 27, 2014. Retrieved April 14, 2015. ^ "Feature Detail Report for: Utica". United States Geological Survey. January 23, 1980. Retrieved April 15, 2015. ^ Schneider, Meg. New York Yesterday & Today. Voyageur Press. p. 101. ISBN 978-1-6167-3126-7. ^ a b c d Czarnota, Lorna (2014). "Utica: Beer and Insanity". Native American & Pioneer Sites of Upstate New York: Westward Trails from Albany to Buffalo. The History Press. pp. 77–81. ISBN 978-1-6258-4776-8. ^ a b c d Thomas 2003, p. 17. ^ Eisenstadt, Peter R. (2005). "Place names". The Encyclopedia of New York State. Syracuse University Press. p. 1208. ISBN 9780815608080. ^ Farrell, William R. (2002). Classical Place Names in New York State. Pine Grove Press. ISBN 9781890691080. ^ Bagg 1892, p. 3. ^ Childs 1900, p. 2. ^ Bagg 1892, p. 21. ^ a b Thomas 2003, p. 15. ^ Bagg 1892, pp. 19–20. ^ a b c Childs 1900, p. 134. ^ Czarnota, Lorna (April 8, 2014). "Utica: Beer and Insanity". Native American & Pioneer Sites of Upstate New York: Westward Trails from Albany to Buffalo. The History Press. p. 77. ISBN 978-1-6258-4776-8. ^ Childs 1900, p. 1. ^ Childs 1900, p. 52. ^ Hulbert, Archer Butler; Hall, James; Wallcut, Thomas; Bigelow, Timothy; Halsey, Francis Whiting; Dickens, Charles; Murray, Sir Charles Augustus (1904). Pioneer Roads and Experiences of Travelers. A. H. Clark Company. pp. 99–108. Retrieved April 29, 2015. ^ Childs 1900, p. 7. ^ Przybycien, F. E. (1976). Utica: A City Worth Saving. Dodge-Graphic Press, Inc.
^ Bagg 1892, pp. 48–49. ^ Bagg 1892, p. 89. ^ Bagg 1892, p. 131. ^ Thomas 2003, p. 22. ^ a b c d Thomas 2003, p. 25. ^ Interstate Commerce Commission Reports: Reports and Decisions of the Interstate Commerce Commission of the United States, Volume 59. Harvard University: L.K. Strouse, United States Interstate Commerce Commission. 1921. p. 142. ^ a b Childs 1900, p. 25. ^ Cookinham, H. J. (1912). History of Oneida County, New York: from 1700 to the present time. New York Public Library: Chicago: S.J. Clarke Publishing Company. ^ Childs 1900, pp. 56–57. ^ Starr, Timothy (2012). Railroad Wars of New York State. The History Press. p. 80. ISBN 978-1-6094-9727-9. ^ Gove, Bill (2006). Logging Railroads of the Adirondacks. Syracuse University Press. pp. 71–75. ISBN 978-0-8156-0794-6. ^ Calarco, Tom (February 23, 2011). The Underground Railroad in the Adirondack Region. McFarland. p. 132. ISBN 978-0-7864-8740-0. ^ a b Switala 2006, p. 80. ^ a b Switala 2006, p. 111. ^ Switala 2006, p. 83. ^ Edwards, Evelyn R. (January 24, 2007). Around Utica. Arcadia Publishing. p. 65. ISBN 978-1-4396-1852-3. ^ Hilton, George W.; Due, John Fitzgerald (January 1, 2000). The Electric Interurban Railways in America. Stanford University Press. p. 121. ISBN 9780804740142. ^ "Annette apologizes for calling Utica 'sin city of the East'". Lakeland Ledger. 78 (5). October 27, 1983. Retrieved April 18, 2015. ^ Lentricchia, Frank (March 4, 2013). "Seeking the truth in Utica". Philly.com. Reviewed by Michael Harrington. Philadelphia Media Network. Archived from the original on April 19, 2015. Retrieved April 18, 2015. ^ Benedetto, Richard (2006). Politicians are People, Too. University Press of America. p. 32. ISBN 978-0-7618-3422-9. ^ a b Webster, Dennis (2012). Wicked Mohawk Valley. The History Press. p. 102. ISBN 978-1-6094-9390-5. ^ Hartman, K. E. (August 14, 2006). "Exploring the Mohawk Valley: Selected Print Resources" (PDF). Mohawk Valley Community College. Archived from the original (PDF) on April 23, 2007. Retrieved April 15, 2015. ^ Thomas 2003, p. 58. ^ Herbers, John (March 26, 1989). "The Region; Tales From Elsewhere: Entering the New Era Of Municipal Rule". The New York Times. ISSN 0362-4331. Retrieved April 25, 2015. ^ Cardarelli, Malio J. (August 29, 2010). "Guest view: There's no denying that 'Rufie' left his mark on Utica". Observer-Dispatch. GateHouse Media. Retrieved April 24, 2015. ^ Croniser, Rebecca (September 14, 2008). "Utica's organized crime revisited". Observer-Dispatch. GateHouse Media. Retrieved April 19, 2015. ^ Thomas 2003, pp. 49–50. ^ Thomas & Smith 2009, p. 24. ^ Thomas & Smith 2009, p. 66. ^ Thomas 2003, p. 113. ^ Hevesi, Alan G. "Population Trends in New York State's Cities" (PDF). Division of Local Government Services & Economic Development. Office of the New York State Comptroller. Retrieved April 18, 2015. ^ Dooling, Sarah; Simon, Gregory (2012). Cities, Nature and Development: The Politics and Production of Urban Vulnerabilities. Ashgate Publishing, Ltd. pp. 165–181. ISBN 978-1-4094-0831-4. ^ Clukey, Keshia (December 28, 2013). "Utica schools have highest poverty rate in Upstate NY". Observer-Dispatch. Retrieved August 24, 2015. ^ Ledbetter, Carly (November 15, 2014). "10 Most Affordable Housing Markets In America". Huffington Post. Retrieved August 24, 2015. ^ Weir, Robert E. (2013). Workers in America: A Historical Encyclopedia. ABC-CLIO. p. 425. ISBN 978-1-5988-4719-2. ^ a b Hartman, Susan (August 10, 2014). "A New Life for Refugees, and the City They Adopted". New York Times. Retrieved April 9, 2015. ^ Coughlin, Reed; Owens-Manley, Judith (2006). Bosnian Refugees in America: New Communities, New Cultures. Springer Science & Business Media. p. 39. ISBN 978-0-3872-5154-7. ^ Brody, Leslie (January 21, 2015). "Small Cities Fight for More School Aid From New York State". Wall Street Journal. ISSN 0099-9660. Retrieved April 19, 2015. ^ "Governor Cuomo Announces 'Nano Utica' $1.5 Billion Public-Private Investment That Will Make the Mohawk Valley New York's Next Major Hub of Nanotech Research". Governor Andrew M. Cuomo. New York State. October 10, 2013. Retrieved April 20, 2015. ^ "Cuomo visits Lake Placid, Utica to talk upstate development". WIVB.com. Associated Press. February 12, 2015. Archived from the original on April 27, 2015. Retrieved April 20, 2015. ^ Cooper, Elizabeth (February 17, 2015). "Cuomo won't budge on $1.5 billion economic development competition". Observer-Dispatch. GateHouse Media. Retrieved April 20, 2015. ^ Thomas, Brian (February 8, 2010). "City of Utica Master Plan Accomplishments / 2.8.10". City of Utica Master Plan. Retrieved April 15, 2015. ^ Miner, Dan (July 12, 2010). "Utica master plan: 'Play ball!' at Harbor Point?". Observer-Dispatch. GateHouse Media. Retrieved April 19, 2015. ^ a b c "Utica (city) QuickFacts from the US Census Bureau". U.S. Census Bureau. Archived from the original on March 23, 2015. Retrieved April 7, 2015. ^ a b Hislop, Codman (1948). The Mohawk. Syracuse University Press. p. 10. ISBN 978-0-8156-2472-1. ^ Hudson, John C. (2002). Across This Land: A Regional Geography of the United States and Canada. JHU Press. p. 71. ISBN 978-0-8018-6567-1. ^ "Utica, NY to Albany, NY". Google Maps. Google. Retrieved May 3, 2015. ^ Thomas 2003, p. 5. ^ "Utica Marsh Wildlife Management Area Overview". New York State Department of Environmental Conservation. Retrieved April 19, 2015. ^ "Utica Marsh" (PDF). New York State Department of Environmental Conservation. Retrieved April 19, 2015. ^ Childs 1900, p. 55. ^ Bottini & Davis 2007, p. ix. ^ a b c Writers' Program. New York (1974). New York: A Guide to the Empire State. North American Book Dist LLC. pp. 353–355. ISBN 978-0-4030-2151-2. ^ "New York State Office Building, Utica". SkyscraperPage.com. Skyscraper Source Media. Retrieved April 18, 2015. ^ Childs 1900, pp. 57–58. ^ Childs 1900, p. 130. ^ Kohn, Solomon Joshua (1959). The Jewish community of Utica, New York, 1847-1948. American Jewish Historical Society. p. 130. OCLC 304259. ^ Bean, Philip A. (2004). La Colonia: Italian Life and Politics in Utica, New York, 1860-1960. Utica College, Ethnic Heritage Studies Center. p. 111. ISBN 978-0-9660-3630-5. ^ Tamburri, Anthony Julian; Giordano, Paolo; Gardaphe, Fred L. (2000). From the Margin: Writings in Italian Americana. Purdue University Press. pp. 386–390. ISBN 978-1-5575-3152-0. ^ "National Register of Historic Places Listings". WEEKLY LIST OF ACTIONS TAKEN ON PROPERTIES: 9/07/10 THROUGH 9/10/10. National Park Service. September 17, 2010. ^ "National Register of Historic Places Listings". Weekly List of Actions Taken on Properties: 1/03/12 through 1/06/12. National Park Service. January 13, 2012. ^ "National Register of Historic Places Listings". Weekly List of Actions Taken on Properties: 9/14/15 through 9/18/15. National Park Service. September 25, 2015. ^ "National Register of Historic Places". Weekly List of Actions Taken on Properties: 1/04/16 through 1/08/16. National Park Service. January 15, 2016. ^ Kottek, Marcus; Greiser, Jürgen; et al. (June 2006). "World Map of Köppen–Geiger Climate Classification". Meteorologische Zeitschrift. E. Schweizerbart'sche Verlagsbuchhandlung. 15 (3): 261. Bibcode:2006MetZe..15..259K. doi:10.1127/0941-2948/2006/0130. ^ a b "Utica, New York Köppen Climate Classification (Weatherbase)". Weatherbase. Retrieved April 23, 2015. ^ "USDA Plant Hardiness Zone Map". United States Department of Agriculture, Agricultural Research Service. 2012. Retrieved April 23, 2015. ^ Catie, O'Toole (January 5, 2015). "Weather: 6 inches to nearly 2 feet of lake-effect snow possible in parts of CNY". Syracuse.com. Retrieved April 19, 2015. ^ Monmonier, Mark (2000). Air Apparent: How Meteorologists Learned to Map, Predict, and Dramatize Weather. University of Chicago Press. p. 151. ISBN 978-0-2265-3423-7. ^ Karmosky, Christopher (2007). Synoptic Climatology of Snowfall in the Northeastern United States: an Analysis of Snowfall Amounts from Diverse Synoptic Weather Types. University of Delaware. Department of Geography. ProQuest. p. 53. ISBN 978-0-5493-8718-3. ^ Childs 1900, p. 136. ^ "Utica, New York Travel Weather Averages (Weatherbase)". Weatherbase. Retrieved April 24, 2015. ^ "NOWData - NOAA Online Weather Data". National Oceanic and Atmospheric Administration. Retrieved October 5, 2015. ^ "NY Griffiss AFB". National Oceanic and Atmospheric Administration. Retrieved October 5, 2015. ^ "Rome, New York". Weatherbase.com. Retrieved April 20, 2015. ^ "Census of Population and Housing". United States Census Bureau. Archived from the original on May 12, 2015. Retrieved March 23, 2015. ^ Clarridge, Emerson (July 11, 2010). "Mayor Roefaro to speak at Bosnian commemoration event in Syracuse". Utica Observer-Dispatch. Retrieved April 6, 2015. ^ "Utica, New York". Modern Language Association. 2000. Retrieved May 8, 2015. ^ Ackerman, Bryan; Cooper, Elizabeth (April 1, 2009). "Area at bottom of Forbes list for business". Observer-Dispatch. Retrieved August 24, 2015. ^ a b "Annual Estimates of the Resident Population: April 1, 2010 to July 1, 2014 - 2014 Population Estimates". United States Census Bureau. Retrieved April 24, 2015. ^ "Residents | Oneida County, NY". ocgov.net. Retrieved August 22, 2015. ^ "American FactFinder". U.S. Census Bureau. Retrieved May 7, 2015. ^ "Hispanic or Latino by Type: 2010". American FactFinder. U.S. Census. Retrieved May 8, 2015. ^ a b c "New York - Race and Hispanic Origin for Selected Cities and Other Places: Earliest Census to 1990" (PDF). U.S. Census Bureau. Retrieved May 7, 2015. ^ "Savage Arms History". Savage Arms. Retrieved May 3, 2015. ^ Thomas & Smith 2009, p. 64. ^ Thomas 2003, p. 38. ^ Thomas 2003, p. 117. ^ "Utica | Buildings | Emporis". Emporis. Retrieved May 8, 2015. ^ a b c "The Regional Economy of Upstate New York" (PDF). New York Fed. Federal Reserve Bank of New York. Archived from the original (PDF) on April 19, 2015. Retrieved April 15, 2015. ^ "Mohawk Valley | START-UP NY". wayback.archive.org. Archived from the original on July 14, 2015. Retrieved December 13, 2015. ^ Bottini & Davis 2007, p. x. ^ Gerould, S. Alexander (January 4, 2015). "DEC has eye on contamination at ConMed site". Observer-Dispatch. GateHouse Media. Retrieved April 23, 2015. ^ "CONMED Corporation News". The New York Times. 2008. Retrieved April 15, 2015. ^ Miner, Dan (May 3, 2012). "DOT unveils accelerated time frame for Arterial project". Observer-Dispatch. Retrieved April 18, 2015. ^ Goodban Belt, LLC (May 2010). "New York State Canal System, Modern Freight-Way" (PDF). New York State Canal Corporation. Retrieved April 24, 2015. ^ "Crime, Arrest and Firearm Activity Report: Utica Index Crimes" (PDF). Division of Criminal Justice Services. Retrieved August 23, 2015. ^ "Mayor's Office". City of Utica. Retrieved May 4, 2015. ^ Miner, Dan (November 17, 2011). "Palmieri wins Utica mayoral election". Utica Observer-Dispatch. Retrieved June 26, 2015. ^ "Common Council". City of Utica. Retrieved April 16, 2015. ^ "Standing Committees". City of Utica. Retrieved April 16, 2015. ^ Thomas 2003, pp. 145–149. ^ Thomas 2003, p. 37. ^ "Utica | Northern District of New York | United States District Court". United States Court, Northern District of New York. Retrieved April 21, 2015. ^ "City of Utica, Financial Statements and Required Reports Under OMB Circular A-133 as of March 31, 2014" (PDF). City of Utica. City of Utica. March 31, 2014. Retrieved April 16, 2015. ^ a b "2015-2016 Board of E & A Approved Budget" (PDF). City of Utica. February 13, 2015. Retrieved April 15, 2015. ^ Sperling, Bert; Sander, Peter J. (May 7, 2007). Cities Ranked & Rated: More Than 400 Metropolitan Areas Evaluated in the U.S. and Canada. John Wiley & Sons. p. 762. ISBN 978-0-4700-6864-9. ^ "Crime, Arrest and Firearm Activity Report" (PDF). Division of Criminal Justice Services. New York State Division of Criminal Justice Services (published March 6, 2015). January 31, 2015. Retrieved April 23, 2015. ^ "Law Enforcement Division - Oneida County Sheriff". Oneida County Sheriff's Office. Retrieved May 8, 2015. ^ "Fire Department". City of Utica. Retrieved May 8, 2015. ^ Bartelma, Katy; Inc, Let's Go (December 13, 2004). Let's Go 2005 USA: With Coverage of Canada. St. Martin's Press. p. 642. ISBN 978-0-3123-3557-1. ^ Santos, Fernanda (October 21, 2006). "Where Young Refugees Find a Place to Fit In". The New York Times. Retrieved April 9, 2015. ^ "Quality of Life". City of Utica. Retrieved April 17, 2015. ^ Nadeau, Mary (September 11, 2008). "A bright outlook on life". Observer-Dispatch. GateHouse Media. Retrieved April 22, 2015. ^ Miltner, Karen (June 20, 2010). "From riggies to cevapi, immigrants have shaped Utica's food scene". Democrat and Chronicle. Gannett. Retrieved April 20, 2015. ^ Monaski, Jeff (June 6, 2013). "Utica Native Shares Chicken Riggies Recipe With Taste Of Home Magazine". WIBX 950AM. Townsquare Media. Retrieved April 20, 2015. ^ Baber, Cassaundra (January 11, 2010). "Next Food Network star: Utica greens". Utica Observer-Dispatch. GateHouse Media. Retrieved April 15, 2015. ^ Levine, Ed (January 15, 2008). "The Best Black and White Cookies? Half-Moons? Amerikaners?". New York Serious Eats. Serious Eats. Retrieved April 15, 2015. ^ Hubbell, Matt (April 16, 2015). "Are Utica's Halfmoon Cookies 'Today Show' Bound?!". lite98.7. Townsquare Media. Retrieved April 20, 2015. ^ "CNYEats A Taste of Utica Mushroom Stews". Apple Crumbles. Retrieved January 5, 2018. ^ Russell, Tina (August 6, 2014). "O'Scugnizzo Pizzeria: A slice of Utica's history turns 100". Utica Observer-Dispatch. GateHouse Media. Retrieved April 15, 2015. ^ "Visitors". City of Utica. Food. Retrieved April 16, 2015. ^ "Quality of Life". www.cityofutica.com. Retrieved April 25, 2015. ^ "F.X. Matt Brewing Co. / Saranac - Brew Central". BrewCentralNY.com. Retrieved April 20, 2015. ^ "Brewers Association Releases Top 50 Breweries of 2012; Top 50 Overall U.S. Brewing Companies (Based on 2012 beer sales volume)". Boulder, CO: Brewers Association. April 10, 2013. Archived from the original on September 21, 2015. Retrieved April 20, 2015. ^ Moses, Sarah. "Boilermaker Road Race makes changes to registration process for 2015". Syracuse.com. Syracuse Media Group. Retrieved April 18, 2015. ^ Braine, Bill (November 2007). Runner's World. 11. 42. Rodale, Inc. pp. 119–120. ISSN 0897-1706. ^ Sharp, Debbie (July 6, 2005). "Opening Set for NASA Exhibits at Utica Children's Museum". NASA. Retrieved April 18, 2015. ^ "The Children's Museum of History, Natural History, Science & Technology". City of Utica. Retrieved April 18, 2015. ^ "PrattMWP, Pratt Institute's Utica, NY campus: A Great Choice for Many Art Students". PrattMWP College of Art and Design. Munson Williams Proctor Art Institute. Retrieved April 18, 2015. ^ Burns, Stanley B. "19th and 20th century psychiatry: 22 rare photos". CBS News. CBS. Retrieved April 18, 2015. ^ Roth, Amy Neff (April 26, 2013). "'Old Main' played important role in history of psychiatry". Observer-Dispatch. GateHouse Media. Retrieved April 18, 2015. ^ "The Straightjacket and Utica Crib: Diagnostik". University of Iowa Hospitals and Clinics. The University of Iowa. November 2, 2001. Archived from the original on May 21, 2010. Retrieved April 14, 2015. ^ "About » Stanley Center For The Arts". Stanley Center for the Arts. Retrieved April 20, 2015. ^ Bottini & Davis 2007, p. 13. ^ a b "Hotel Utica – A History". Hotel Utica. Archived from the original on February 9, 2015. Retrieved April 18, 2015. ^ Tucker, Libby (2013). "New York's Haunted Bars". Voices. 39 (Spring–Summer). Retrieved April 20, 2015. ^ "Utica Comets to join AHL in 2013-14". TheAHL.com. American Hockey League. June 14, 2013. Retrieved June 14, 2013. ^ "Introducing the Utica Comets of the AHL | ProHockeyTalk". wayback.archive.org. Archived from the original on September 6, 2015. Retrieved December 13, 2015. ^ "United Hockey League history and statistics at hockeydb.com". hockeydb.com. Retrieved April 20, 2015. ^ Worth, Richard (February 26, 2013). Baseball Team Names: A Worldwide Dictionary, 1869-2011. McFarland. p. 311. ISBN 978-0-7864-6844-7. ^ "Overview". SUNY Poly Athletics. Retrieved August 19, 2015. ^ "Overview". Hamilton College. Retrieved August 19, 2015. ^ "Sports Information". Utica College Pioneers. Retrieved August 19, 2015. ^ "Mohawk Valley Community College". NJCAA. Retrieved August 19, 2015. ^ "About The Herkimer Generals Athletic Program". www.herkimergenerals.com. Retrieved August 20, 2015. ^ a b "Parks and Recreation". City of Utica. Retrieved April 19, 2015. ^ "Parks & Open Spaces". www.cityofutica.com. Retrieved August 21, 2015. ^ Vincent (January 1, 2007). Lin Smith, Vincent; Waller, Sydney (eds.). Sculpture Space: The Book : for the Artists and Individuals who are Part of the Sculpture Space Story. Thomas Piché, Sculpture Space (Studio). Sculpture Space, Incorporated. pp. 63–65. ISBN 978-0-9795-9690-2. ^ "Memorial Parkway | Explore Our Parks | Central New York Conservancy | Mohawk Valley". Central New York Conservancy. Retrieved April 20, 2015. ^ "Proctor Park". Oneida County Historical Society. Oneida County Historical Society. Archived from the original on 9 April 2015. Retrieved 19 April 2015. ^ "Explore Our Parks in Utica, New York". Central New York Conservancy. Retrieved April 20, 2015. ^ Pitarresi, John (December 22, 2012). "Val Bialas Sports Center: Let it snow, let it snow, let it snow". Observer-Dispatch. GateHouse Media. Retrieved April 19, 2015. ^ "Parks & Open Spaces". City of Utica. Retrieved April 19, 2015. ^ Thomas 2003, p. 156. ^ "Centro Utica". Centro. April 1, 2013. Archived from the original on March 18, 2015. Retrieved March 21, 2015. ^ "Central New York - Weekday Line Runs" (PDF). Birnie Bus Service, Inc. Retrieved April 7, 2015. ^ "Greyhound.com, Utica, NY". Greyhound. Archived from the original on December 13, 2015. Retrieved April 7, 2015. ^ "Central New York - Saturday Line Runs" (PDF). Birnie Bus Service, Inc. Retrieved April 7, 2015. ^ a b Thomas 2003, pp. 114–115. ^ Thomas 2003, p. 114. ^ Report on State arterial route plans in the Utica urban area. University of Michigan: New York State Department of Public Works. 1950. ^ "Google Maps". Google Maps. Retrieved August 22, 2015. ^ "National Grid - 2002 News Releases". nationalgridus.com. Retrieved April 21, 2015. ^ "New York Transco Transmission Projects". New York State Electric & Gas. Retrieved April 21, 2015. ^ "Major Transmission Facilities Included In and Excluded From the Transmission Revenue Requirement" (PDF). New York Power Authority. Archived from the original (PDF) on 28 March 2015. Retrieved 21 April 2015. ^ Kemble, William J. (November 16, 2013). "Proposed power line through Mid-Hudson region stirs concerns". The Daily Freeman. 21st Century Media. Retrieved April 21, 2015. ^ Roth, Amy (September 18, 2014). "Mini electric stations, such as at Faxton St. Luke's, being touted". Observer-Dispatch. GateHouse Media. Retrieved April 21, 2015. ^ Zeman, F. (September 11, 2012). Metropolitan Sustainability: Understanding and Improving the Urban Environment. Elsevier. p. 544. ISBN 978-0-8570-9646-3. ^ Miner, Dan (January 26, 2012). "Utica forming panel to study possibility of new power system". Observer-Dispatch. GateHouse Media. Retrieved April 21, 2015. ^ "Proceeding To Examine Policies Regarding the Expansion of Natural Gas Service Case 12-G-0297" (PDF). New York State Public Service Commission. National Grid. January 9, 2013. Retrieved April 21, 2015. ^ Handelman, David. "National Grid requests $400,000 from city". Observer-Dispatch. Retrieved April 21, 2015. ^ "Service Area". New York State Electric & Gas. Retrieved April 21, 2015. ^ "City of Utica Garbage & Recycling: Collection & Disposal Information" (PDF). Oneida-Herkimer Solid Waste Authority. Archived from the original (PDF) on April 27, 2015. Retrieved April 21, 2015. ^ "About Us » Oneida-Herkimer Solid Waste Authority". Oneida-Herkimer Solid Waste Authority. Retrieved April 21, 2015. ^ a b "Water Quality". Mohawk Valley Water Authority. Retrieved April 20, 2015. ^ a b "Water Quality Report 2014" (PDF). Mohawk Valley Water Authority. 2014. Retrieved April 20, 2015. ^ Cooper, Elizabeth (September 27, 2015). "Region boasts plentiful, clean water". Observer Dispatch. Retrieved September 27, 2015. ^ a b "About the Mohawk Valley Health System". Mohawk Valley Health System. Retrieved April 21, 2015. ^ "Fact Sheet". Mohawk Valley Health System. Archived from the original on April 27, 2015. Retrieved April 21, 2015. ^ Roth, Amy Neff (September 23, 2015). "Downtown first choice for new hospital". Observer Dispatch. Retrieved September 23, 2015. ^ "Campuses / SUNY Polytechnic Institute (formerly SUNYIT)". The State University of New York. The State University of New York. Retrieved April 18, 2015. ^ "Contact Information for SUNY Technology Colleges". OPEN SUNY. Retrieved April 24, 2015. ^ "SUNY Vice Presidents for Research - RF for SUNY". SUNY Research Foundation. Archived from the original on May 18, 2015. Retrieved April 24, 2015. ^ "About MVCC". Mohawk Valley Community College. Archived from the original on April 19, 2015. Retrieved April 24, 2015. ^ "Utica | Central New York | SUNY Empire State College". www.esc.edu. Retrieved August 22, 2015. ^ "About Utica College". Utica College. Retrieved April 18, 2015. ^ "History | St. Elizabeth College of Nursing | Utica, NY". St. Elizabeth College of Nursing. Retrieved April 24, 2015. ^ "Pratt BFA Degrees | Top Ranked Design & Fine Arts Programs » PrattMWP". PrattMWP College of Art and Design. Retrieved April 24, 2015. ^ Amy Roth, Utica Observer-Dispatch (December 5, 2016). "Utica School of Commerce closing after 120 years". Utica Observer-Dispatch. Retrieved December 30, 2016. ^ "Utica City School District". Federal Education Budget Project. New America Foundation. 2012. Retrieved April 17, 2015. ^ Scott Thomas, G (June 25, 2015). "Utica scores highest in Upstate New York for racial diversity in public schools". Buffalo Business First. American City Business Journals. Retrieved June 25, 2015. ^ Tracey, Sarah (April 5, 2014). "UFA to celebrate 200 years of memories, milestones". Observer-Dispatch. GateHouse Media. Retrieved April 19, 2015. ^ NDHS. "School History". Notre Dame High School website. Archived from the original on April 16, 2007. Retrieved May 11, 2007. ^ "WKTV bringing CBS affiliation to Utica". WKTV. October 26, 2015. Archived from the original on November 26, 2015. Retrieved December 4, 2015. ^ "About TWC News". TWC News. Retrieved April 19, 2015. ^ "Dish Network to Become First Pay-TV Provider to Offer Local Broadcast Channels in All 210 Local Television Markets in the United States" (PDF). Dish Network - Investor Relations. Comtex News Network. May 27, 2010. Archived from the original (PDF) on April 19, 2015. Retrieved April 19, 2015. ^ "Get DirecTV in Utica". DirecTV. Retrieved April 19, 2015. ^ Geruntino, Gino (December 28, 2011). "Utica Phoenix Gains Official Newspaper Designation". WIBX950. Townsquare Media. Retrieved April 18, 2015. ^ Thomas 2003, p. 8. ^ Thomas 2003, p. 121. ^ a b Lynn, Naomi (January 6, 2015). "Utica Gets Plenty of Attention In The Entertainment World: These TV Shows And Movies Prove Utica Is More Popular Than You Think". lite98.7. Townsquare Media. Retrieved April 19, 2015. ^ Ginsberg, Allen (1956). Howl and Other Poems. City Light Books. p. 24. ISBN 978-0-8728-6017-9. ^ Herbert, Geoff (September 18, 2013). "Night Ranger, Gordie Howe and 'Slap Shot' stars coming to Utica Comets' first home game". Syracuse.com. Retrieved August 19, 2015. ^ Fran Perritano (May 28, 2010). "'Hanson Brothers' will return to Utica Aud". Utica Observer-Dispatch. Archived from the original on February 9, 2013. Retrieved September 12, 2010. ^ "Library Information". Mid York Library System. Retrieved June 18, 2015. ^ "About MYLS". Mid York Library System. Retrieved June 18, 2015. Bagg, M. M. (1892). Memorial History of Utica, N.Y.: From Its Settlement to the Present Time. Cornell University Library: D. Mason & Co. Publishers. OCLC 1837599. Bottini, Joseph P.; Davis, James L. (2007). Utica. Arcadia Publishing. ISBN 978-0-7385-5496-9. Childs, L. C. (1900). Outline History of Utica and Vicinity. New Century Club, Utica, New York. OCLC 1558992. Switala, William J. (2006). Underground Railroad in New Jersey and New York. Stackpole Books. ISBN 978-0-8117-3258-1. Thomas, Alexander R. (2003). In Gotham's Shadow. State University of New York Press. ISBN 978-0-7914-5595-1. Thomas, Alexander R.; Smith, Polly J. (2009). Upstate Down: Thinking about New York and Its Discontents. University Press of America. ISBN 978-0-7618-4500-3. Bartholomew, Harland (1921). A Preliminary Report on Major Streets, Utica, New York. Willard Press. OCLC 682139143. Ferris, T. Harvey (1913). Utica, the Heart of the Empire State. Library of Congress. ASIN B00486TJ2C. Kobryn, Nancy (1995). Guts and Glory, Tragedy and Triumph: the Rufus P. Elefante Story. Steffen Pub. OCLC 40756638. Pula, James S. (1994). Ethnic Utica. Ethnic Heritage Studies Center, Utica College of Syracuse University. ISBN 978-0-9668-1785-0. Utica Public Library (1932). A Bibliography of the History and Life of Utica; a Centennial Contribution. Goodenow Print. Co. OCLC 1074083. This page was last edited on 20 April 2019, at 19:28 (UTC).